Staff Correspondent: The prices of vegetables slightly fell in the kitchen markets of the capital over the week due to increase supply. 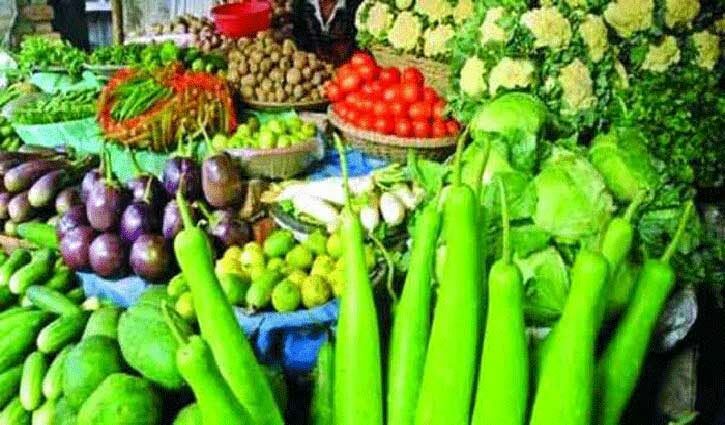 Visiting several retail kitchen markets in Dhaka, including Jigatola, Rayer Bazar, this correspondent found that the prices of various vegetables have come down by Tk 5 to 7 per kilogram compared to the previous week. On Friday, aubergine were being sold at Tk45-60 per kg. Cucumber at 50, Tomato at Tk40 per kg, bean at Tk30. Green Chili was being sold at Tk 100 per kg only a month ago, but it is now available for Tk 80. Snake gourds, bitter gourds and pointed gourds are being sold at Tk 35–45 per kg. Besides, Onion, eggplant, beans, carrot, turnip, red spinach and other vegetables are available at a fairly cheap rate. As in the last few months, prices of broiler chicken, beef and mutton remained unchanged.